Enter a name for the WriteContainer here, this has to be unique. If this is not the case, a corresponding notification will appear. Select the type of your choice here. 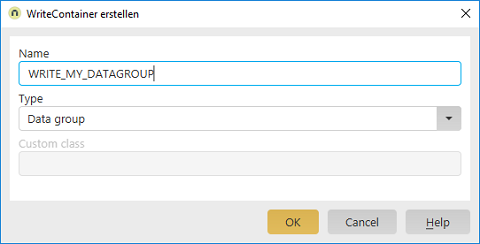 The "Datagroup" type allows you to write data to any data group - even from other applications. 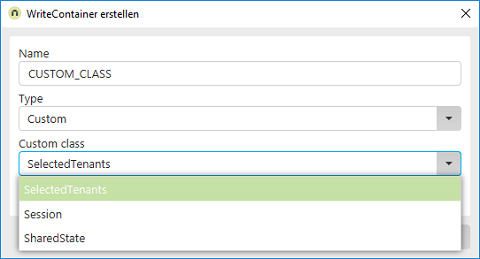 If you select "Custom class", the appearance of the dialog will change. Custom Java classes can be integrated here. You can choose between a session value, a value in the SharedState or from a tenant (SelectedTenants). More information on this subject is available in our Academy seminars.